I purchased by 920XT, about 10 days prior to my cycling accident, which was rather annoying in terms of being able to test it out properly. But from a personal standpoint, I have actually found some of the watch features, particularly the adaptive pedometer, to be very useful for my rehabilitation. 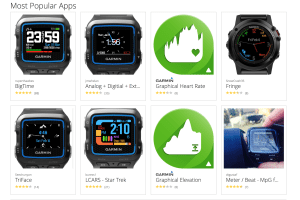 Prior to this review, I’ve extensively used a series of other running/triathlete watches, Garmin Forerunner 310, Polar RS3 and Garmin Forerunner 620, in addition to a slew of iPhone apps to look at the general metrics from an entirely different perspective. The Garmin Forerunner 920XT plenty of screen space to hold four running data screens, each of which can hold four data fields. In addition, there are four supplementary screens covering, map, virtual partner, running dynamics and clock. 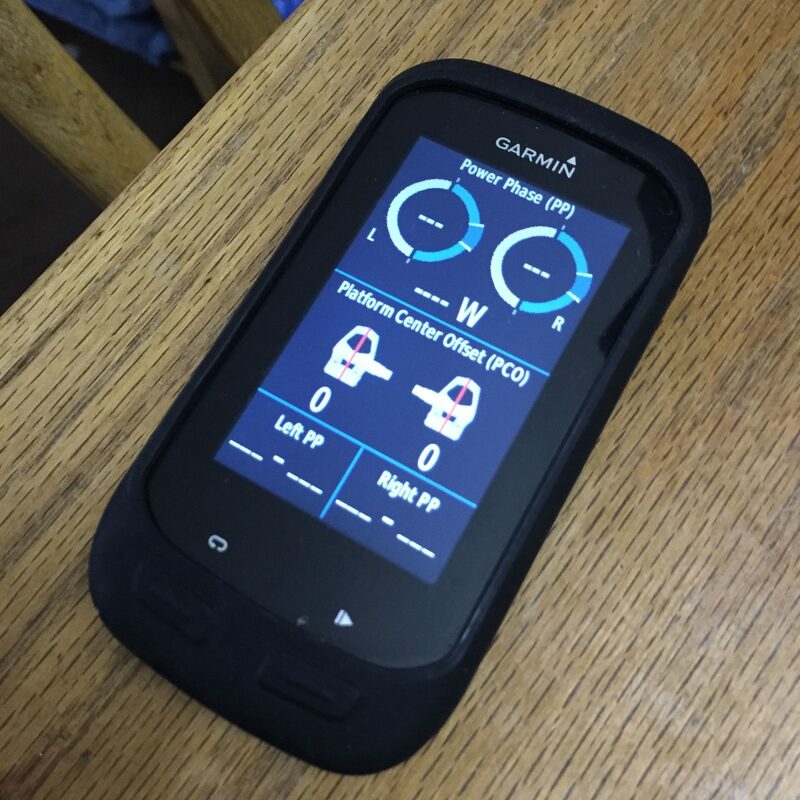 Garmin have recently included Connect IQ in the latest firmware (2.70) update for the 920XT. The main effect of this is a perceptual changes as to how the different “activities” within the watch run. Previously, when selecting “Running”, it was a Mode. Now however, to allow for other creations, such as the potential for “Nordic Skiing”, or “Which animal speed are you?” the activities now run as dedicated apps. This has little effect on the end user, other than allowing for great functionality of your wrist computer. So to activate the running app, you must unlock the watch, by taking it out of standby mode and pressing the side “…” key, which then asks you to hit the enter key to unlock the watch. A slightly clunky mechanism, but certainly ensures you get maximum life out of the watch, and you don’t start randomly hunting for GPS satellites when not needed. The Garmin 920XT “…” Key – usefully named! From there scrolling through the menus to “Run”. Hit “enter” button to go into the app, and again to start the activity and you are away. 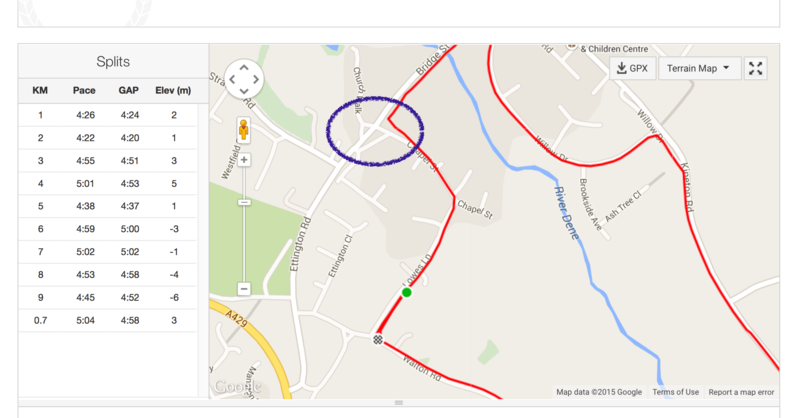 The above picture is from Strava showing a running route I commonly take out of the house. The green dot shows where my run “started”. However I actually hit start, and began the run from within the purple circle. So although the watch says the GPS satellites have been identified, there seems a slight lag in that locking. Unfortunately this is not an isolated event, as I continually miss the start of a Strava segment that is at the beginning of Lowes lane on the map, meaning I have to run it at the end of a loop again. The 920XT, has carried over all the alert options from earlier watches. Allowing you to have audio, and physical notifications to say that you are going outside whatever desired range you have set for a specific metric. Heart rate, cadence, distance, calories etc. Those previous metrics alarms can be added to in the form of Running Dynamics alarms. As I’ll come onto now, Running Dynamics, and the coaching made possible by the alarms can really help change things with your running. The inclusion of running dynamics on the Garmin Forerunner 920XT watch, both in my experience prior to the injury, and subsequently getting back into shape suggests this is quit a significant feature. I say significant, as most GPS fitness devices, and I don’t just mean running watches, essentially aim/push you to improve your speed, through helping you train looking at pace, heart rate, distance and time. 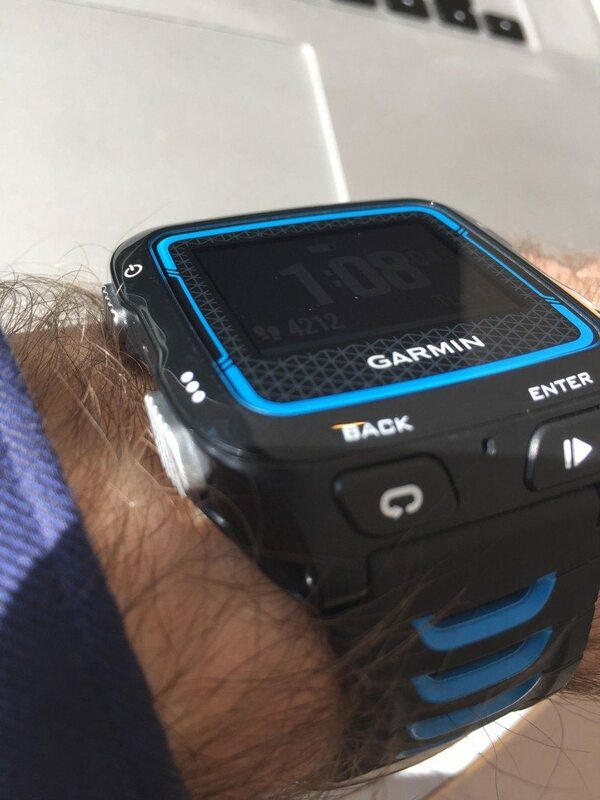 However the important difference when compared to Garmin Running Dynamics, is that a general fitness device don’t really help you become a BETTER runner. 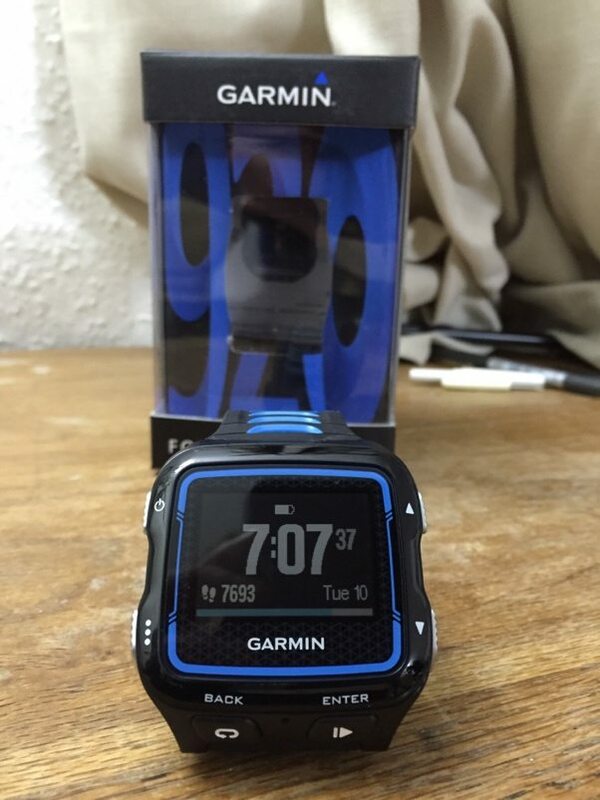 Running dynamics is not a new feature on the Garmin Forerunner 920XT. It debuted on the Garmin Fenix2 and FR620 watches with the HeartRate-Run (HRM-Run) strap. 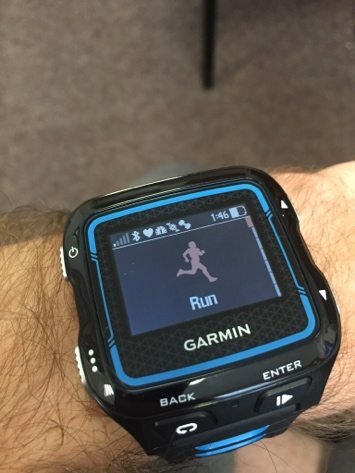 I havsuggested the Garmin Forerunner 920XT can make you a better runner. 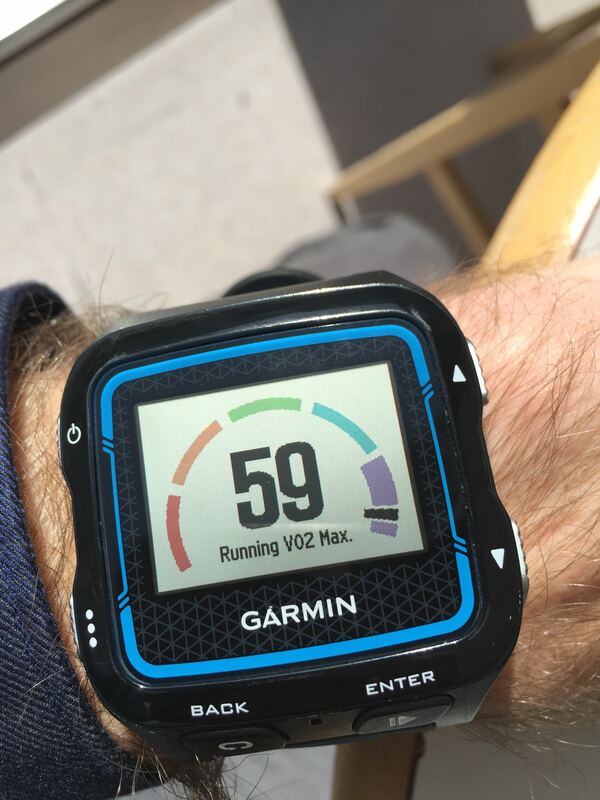 The running dynamics data is how it achieved that Garmin’s running dynamics comprises three data measurements – GCT – ground contact time, Cadence, and VO – vertical oscillation. On the 920XT they included cadence in the watch itself as well as in the HRM-Run strap. I suppose having the duplication of a data source helps for an impromptu run, where you don’t have access to the HRMrun Strap, but otherwise I’m not quite sure why they did this! Now I’ve suggested previously that Running Dynamics might help make you a better runner, so what do these terms actually mean, and how can running dynamics do this? This is a measure of how long your foot touches the floor during each step. How does know this help? GCT is essentially the inverse of cadence. The greater the cadence, or the more steps per minute, the less time your foot spends in contact with the ground, so the lower the GCT. In which case, GCT could be considered as a verification metric for cadence. Very similar to the cadence of the bike. This is how many times in a minute your foot strikes the floor. On the 920xt the strike data is recorded, and then doubled, so you know how often both feet are hitting the floor. Cadence, and knowing about running cadence has had a large effect on my running. Professional runners try to keep a cadence of approximately 90/180 BPM. The benefits of this high cadence are the same as high cadence on the bike. The same total power output for less strain on the legs. Admittedly I can’t quantify what my actual running power is – yet – I’m waiting for my Styrd Powermeter to arrive, and will be able to talk more about how accurate this hypothesis on cadence and power is. Personally I have found the increasing my cadence – which was actually rather hard work, it seems my “natural” cadence was about 75/150spm. Increasing this to the recommended 90/180 BPM was easier than getting/maintaining a high 110SPM cadence on the bike. Increasing my cadence when running has seemed to pay great dividends. One factor I was surprised at was speed creep, increasing the cadence whilst maintains the same speed was very challenging. Increasing cadence whilst but keeping a steady 13kmph. Improving my cadence to 170-175 has yielded much less strain on my legs, and much less discomfort on longer runs from my right knee. An injury about 2 yrs ago has meant I need to be careful not to “run off” my knee. I have a choice, blast out a sub 20min 5km, and then stop due to discomfort. Or put in a 50min 10km before discomfort. By increasing my cadence, I found I was able to increase/maintain my speed, with less strain on my knee, and thus able to run for longer! Plus you are properly tired at the end of a high cadence run!! As above, you can set alarms, to ensure you maintain within a particular cadence. One variation on the arm I really like is the Garmin Forerunner 920XThas a built in metronome which can sent timing signals audibly, or via beeps, in order to help you maintain a particular pace. The pulse/beep is emitted on every 4th beat in order to try and reduce the impact on the battery. Some people might consider this to be a relatively rudimentary feature, however for those who are new to the concept of trying to hit a particularly running cadence, it is very useful as a training tool to help a person get a marker for a particular cadence, assisting in adapting their running style as they do. This is the big metric for making your run and your stride more efficient. Vertical oscillation is literally about wasted energy. One way of looking at it, is how high you head bobs up and down. If you look at professional runners, their head stays in a pretty constant location, height wise, during a race. This means that the maximum about of the energy from their legs is directed to propelling them forwards, and a minimal amount of energy is directed to, wasteful, vertical movement. Vertical oscillation, can be thought of as bouncing. This is natural and is part of a running stride anyway. Knowing the running dynamics helps to optimise your metrics. As you increase in cadence, the vertical oscillation will naturally reduce, so by using the two metrics together, making you a more efficient runner. The data does it actually help? Personally, one things I LIKE about Running Dynamics, is it matters. The data MEANS something, and by adjusting your running style and performance to match calculated/evidence based perameters you can improve. As previously mentioned, focusing on Vertical Oscillation tends to improve running efficiency. Why do I mention this here? The Garmin edge 1000 has a series of Cycling Dynamics data, that are possible, and coincidentally only available through the use of Garmin Vector pedals. So could Cycling Dynamics help you become a BETTER rider, as the Running Dynamics Does? Possibly. I say possibly, as we don’t know. 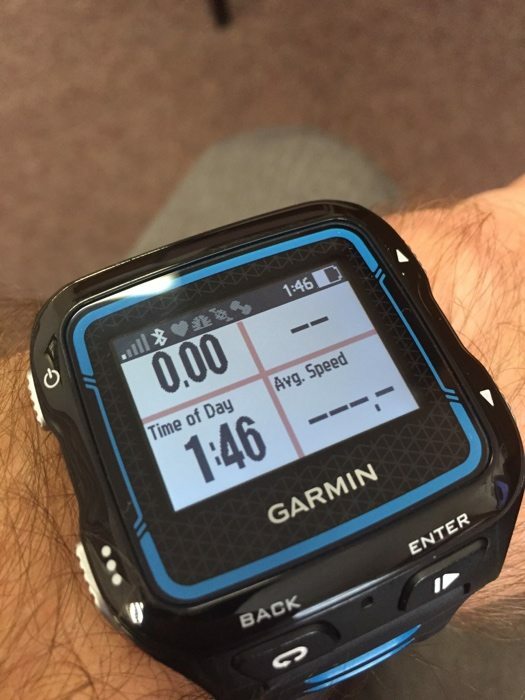 Garmin has found a way of measuring a series of data we’ve never broadly had before. The upshot of this is sports scientists are currently trying to work out what the implications of this data is – IF ANY. 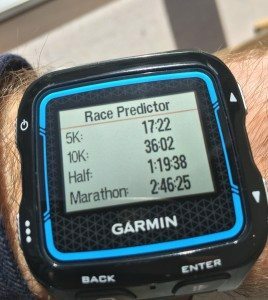 It may transpire that this information is analogous to the thermometer on the Garmin Forerunner 920XT for running, in the real world, largely irrelevant. 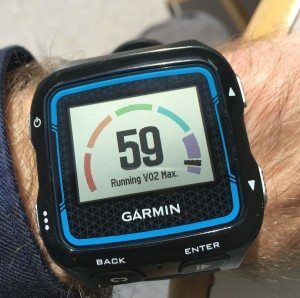 Within the “My Stats” section of the watch, the Garmin Forerunner 920XTalso has the ability to calculate your estimated VO2Max for running, AND cycling. Something that none of this Garmin Edge series are yet able to do. VO2Max is measure of maximal oxygen consumption. Broadly this is the most effective measure of cardiovascular fitness we have. Asa result VO2Max is a metric it’s difficult to improve on, as it takes a long time, but at any point gives a global impression of your fitness for a particular sport. 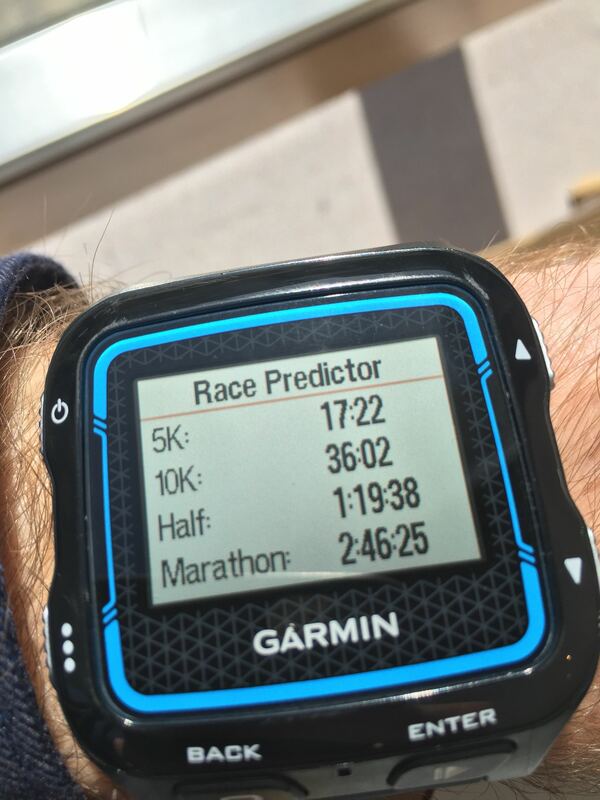 Its main function within the Garmin Forerunner 920XTis to allow it to calculate race predictions. I’ve been quite surprised by the predictions it has given for me, I think they are possible, I just perhaps need to push myself a lot little more. Or saving that, be in the actual race environment. In this sense I like it, as it gives a target to aim for, and one that has some basis for its estimation, rather than just pulling targets out of the air – crucially which might be unrealistic! 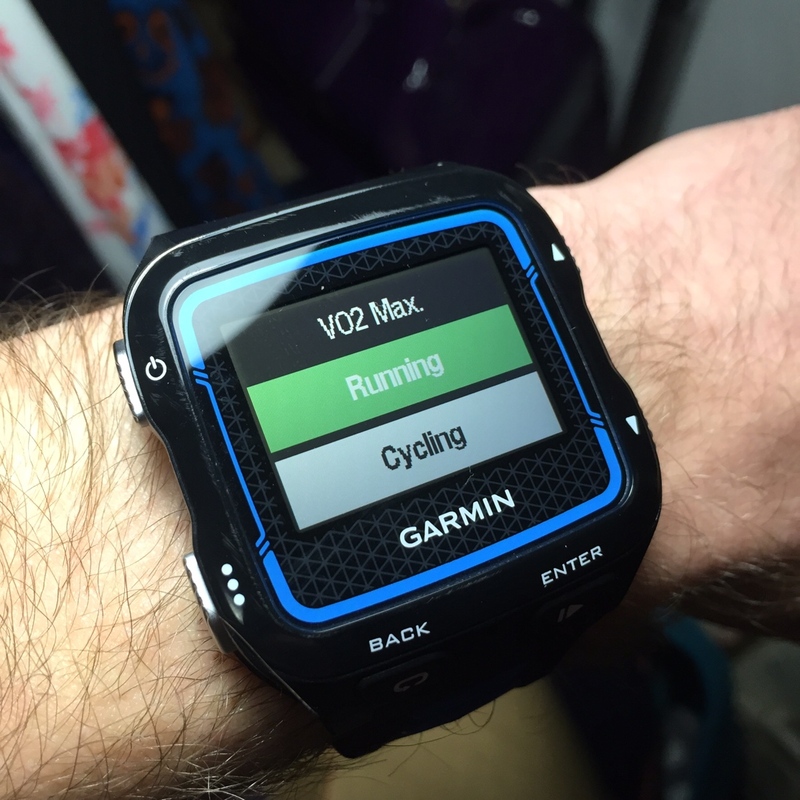 To get VO2Max for cycling, you need to be using the Garmin Forerunner 920XTwith a power meter, as well as the HRM. Currently my cycling VO2max is 56, whilst my running has steadily risen from 56 to 59. That in of itself is a very important factor about both disciplines VO2 measurements. They take time, and several runs/cycles to normalise. Garmin are very coy about what the numbers translate to, particularly as they don’t want to discourage/insult a customer. But 35ml/kg/min is approximately an untrained adult male, whilst an untrained woman, is about 30. By comparison an elite, endurance male athletes can get in the 80-90ml/kg/min range. So I’ve still got plenty of training yet to do!! Whilst I don’t think the running dynamics will affect my recover as much as another measurement within taken from the VO2Max and HR, the Recovery Advisor. Prior to my injury, I’ve never been very good at listening to my body, or training carefully. My rest days would be more along the line of “I can’t be bothered” rather than a specificly scheduled rest. But that “I don’t have the energy” feeling was probably due to over training as well. I has been very surprised that by following the advice of the advisor – e.g. Not to train again for 27hrs, my training was actually improving. I was getting much less of the “empty leg” feeling I would normally get the next day after a hard run/bike. The final section of “My Stats”, is the same as seen on the Garmin Connect website. Personal Records. Again the same as in previous generation watches, given your personal bests on 1km, 5km, 10km, and marathon runs. From all the pictures on this review so far, hopefully you can see the excellent colour reproduction. In comparison to the attempt at “colours” on the Garmin 620. This looks like a watch made in 2015, not 2005!